Austraflora are totally pumped to tell you about PowerFeed’s amazing new product! Your favourite fertilisers are now available in an easy-to-use pump pack. With a simple push, 10 mL will be dispensed into your watering can. There’s no need to measure or calculate! Add to your water and you’re set to fertilise your garden. You can use over the soil and foliage for a healthy and thriving garden. There’s no spill and wastage! 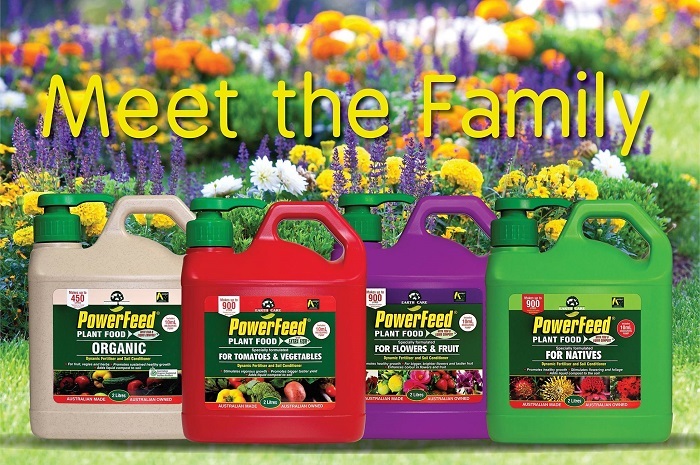 PowerFeed is an organically based liquid fertiliser and soil conditioner. By using it in your garden your plant growth and vigour will be boosted! It also helps to stimulate flowering and fruiting. Not only is it great for the plants – it is excellent for your soil health. PowerFeed contains active liquid composts which improves soil structure and also stimulates the growth of beneficial microbes that break down organic matter and release soil nutrients. PowerFeed will also help to break down clay and reduce nutrient losses in sandy soil. It’s an all ‘round winner! The pump packs are available in 4 different fertiliser types – so you can get the best one for the job! Head to the local nursery to find yours today!